As autumn comes to an end, winter hive preparation takes place. Hives have been put into winter mode, ready for the harsh conditions here in rural Northumberland. What winter hive preparation has already been done? 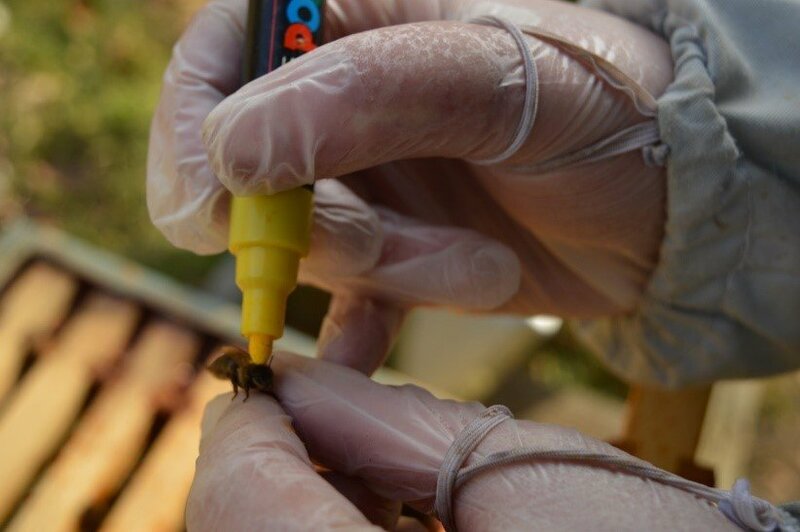 Feeding is a key part of winter hive preparation. 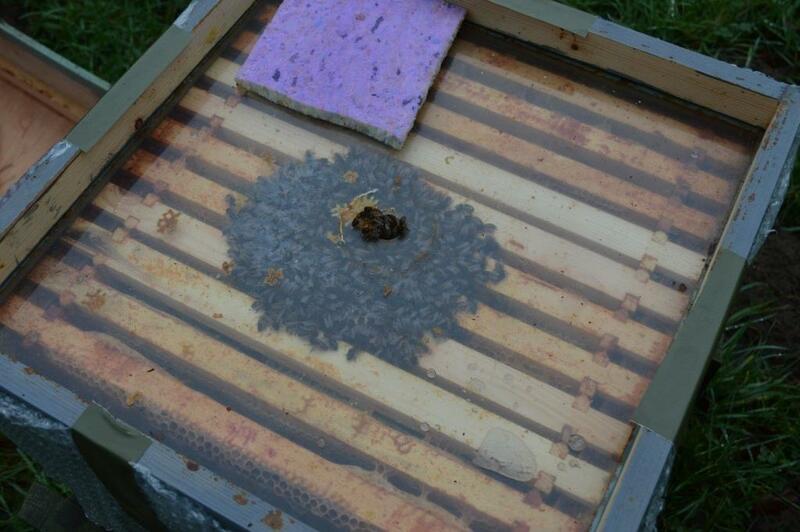 Winter Feeding took place during the autumn, after the hives were treated for varroa using Apiguard. I like to use sugar syrup and feed it to the bees through rapid feeders. Strong sugar syrup is used for winter feeding and 60:40 sugar to water solution can be achieved without heating the mixture. I prefer to use sugar syrup for winter feeding because its cheap and simple to make up, the bees add their natural enzymes to break it down and I can add a small amount of Thymol to it. 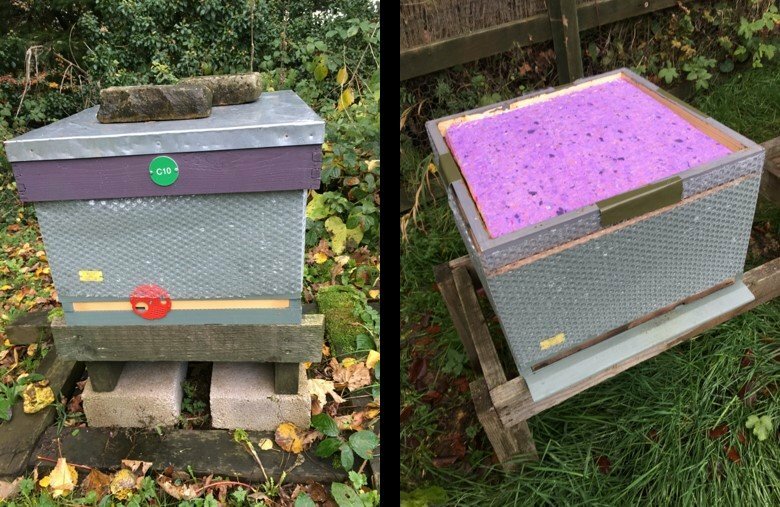 There is an article on the national bee unit’s website, which suggests that Thymol can prevent mould growth in the syrup and Kirsty Stainton’s article in BBKA News in November suggests that it can reduce Nosema spores and their effect on the colony. The aim of the feeding was to attempt to fill the brood body with enough stores for the colony to thrive all the way through to March the following year, without disturbing the cluster but still allowing the crown board to be removed for oxalic acid trickling between Christmas and New Year’s Day. My aim is for winter hive preparation is for the colonies to go into winter on a single brood body, full of capped stores. 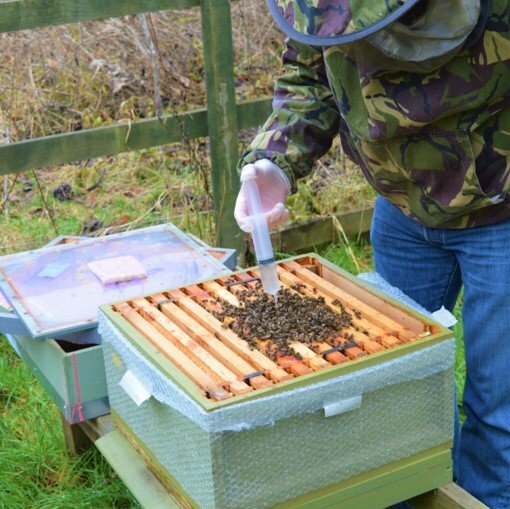 The conditions are harsh in rural Northumberland and the focus of my bee breeding programme is to develop healthy, calm bees, productive bees which over winter well and are efficient with their stores. Through wing morphology and DNA testing I’ve established that my bees are near native to the area. Although they are not the most prolific of bees, they can still fill double brood bodies in the summer. We know that a “National” brood body is not large enough for a colony during the summer, but I only really appreciated recently that it is only not big enough for about 4 months of the year! So when the colony is growing in the spring I add a second brood body. I then have options for using this to “split” the colony as part of swarm control or to implement a comb change when the colony starts to reduce in size towards the end of the summer. I try to avoid having a double brooded colony going into winter and never use brood and a half. 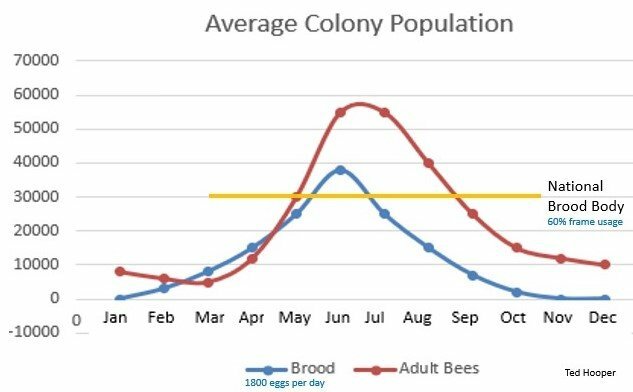 The graph below shows the logic of this and can be found in Yates’ Beekeeping Study Notes and Ted Hooper’s Bees & Honey. How are the hives set up for winter? The configuration that I use is based on a suggestion by Clive be Bruyn in his book Practical beekeeping. The idea is that the open mesh floor provides adequate ventilation to the colony during the winter. Clearly as part of the winter hive preparation, hives needs to be sheltered from direct wind and drafts. With this amount of ventilation there is no need to have a flow of air through the crown board or roof. The aim is to prevent an upward vertical flow of air through the hive and actually “trap” the warmth in the top of the hive. Condensation is avoided because the water vapour does not have anything in the top of the hive cold enough for it to condense on and the ventilation proved by the mesh floor provides a movement of air. Carbon Dioxide, produced by the cluster “breathing” is heavier than air and will “fall” out of the mesh floor, which prevents a build up of this gas. The cluster requires an incredibly small amount of stores to keep them alive. Most of the stores are used maintaining the temperature of the cluster and this is directly related to the rate of heat loss from the hive and the surface area of the cluster. Smaller clusters take less energy to keep at temperature and insulated hives lose less heat, especially if the heat is “trapped” in, as it rises. 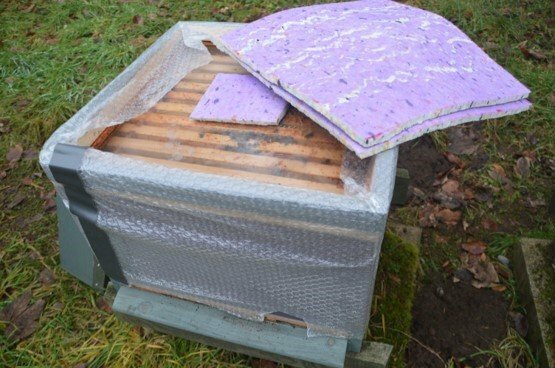 To insulate the hive during the winter I place a 32mm Eke above the crown board and put one or two layers of foam underlay in the eke. This reduces the heat loss in the top of the hive and keeps the crown board near to cluster temperature, avoiding condensation. I also “bubble wrap” each hive. This does have a slight insulation effect, but the main benefit is to keep the top part of the hive dry during the winter. Even surface water on the woodwork can create a refrigeration effect when it evaporates in the sun on a cold winter’s day. The bees use this evaporation cooling effect in summer to cool the brood comb! has the cluster formed or has dispersed ? has the colony used up all the capped stores and need supplementary feeding ? is the cluster isolated from its stores ? are there signs of nosema on the top bars ? The entrance blocks I make for my hives have two openings. The winter side of the block has an opening which is 20mm x 7mm. This is large enough for a worker to drag a dead bee through but small enough to prevent a mouse getting into the hive. I’ve never had a mouse get through one and never had one blocked with dead bees. In this blog I have tried to show my strategy for winter hive preparation to get my colonies through the winter. My aim is for them to “thrive” not just “survive”. Winters can be harsh here in rural Northumberland but there are carpets of snowdrops in February, for colonies ready to take advantage of them. The approach is based on ensuring ventilation, insulation and keeping the colony dry. 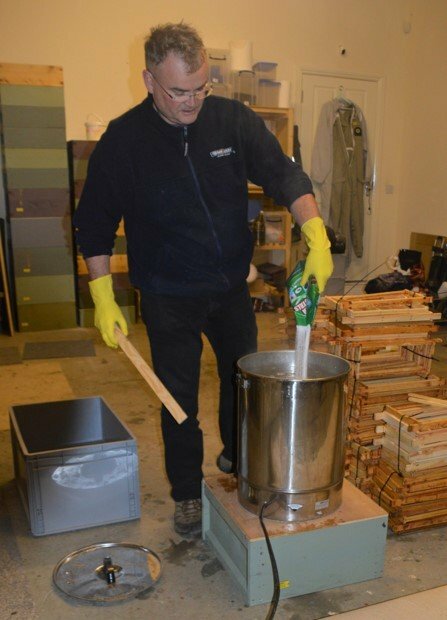 Winter hive preparation started much earlier in the season, with the aim of going into winter with healthy, Calm, productive bees in single brood bodies, on clean comb and with large quantities of capped stores. Now is a good time to make the final preparations to make sure your hives are “beast ready” and to think about the equipment you want to make or buy over the winter to have a great season next year. If you have found this interesting please subscribe to my blog and share on Facebook. Excellent advice, thank you Ian. I use polycarbonate crownboards too – I find them excellent. In addition to your snowdrops would you like a Salix aegyptiaca – an early flowering willow – an excellent pollen source for early foraging bees. I have access to a source and could post you a sample or hand it over next year. Yes, lets do a plant swap. Anything you need for your herbarium?